Reckon she got a load of heat on Twitter, well no. 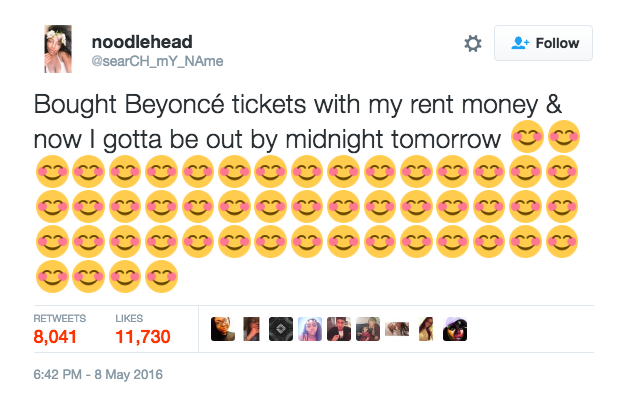 She said that the reactions were generally pretty nice with mostly people saying, “shelter comes and goes but Beyonce is forever.” Others suggested she convince Beyonce to help her out with a few quid, while others offered her a place to stay if they took them to the concert with her. Johnson said “My priorities are definitely in check to be honest. I just am a die hard Beyonce fan. I had the time of my life. Literally.” She said she’s graduating college and wanted to go out with a bang.